Get a bird’s eye view of the city from the World Trade Center. 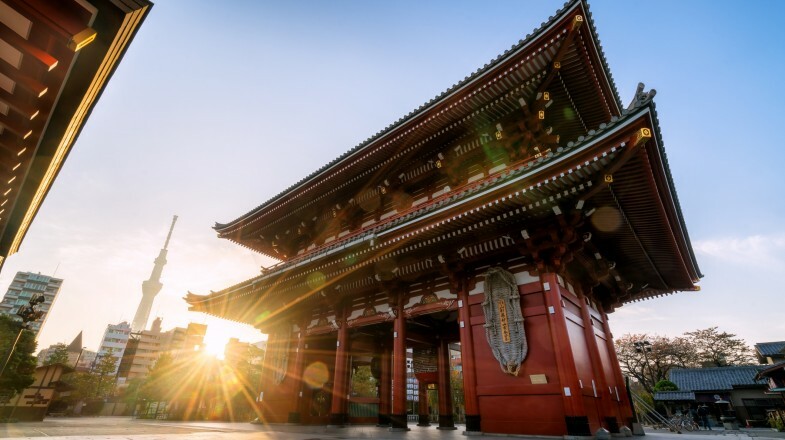 Experience the Asakusa Kannon Temple & Imperial Palace. Take a relaxing cruise on Tokyo’s enchanting Sumida River. A dazzling metropolis that has a stoically traditional vein through under its ultra-modern facade, a trip to Tokyo is a juxtaposition in itself. Straight out of a sci-fi film, modern Tokyo pushes the boundaries of what’s believable, even in this day and age – and yet the Imperial past is always close by. The vast metropolitan area of Tokyo is made up of the new, the old, and the outlying and it can take a lot of time to truly know the city. But each and every visit to Tokyo, no matter how brief, is always an eye-opening experience. Visit to Tokyo’s most popular temple Sensō-ji, home to Kannon the Buddhist goddess of mercy, at night when the crowds have dispersed and the temple is illuminated. The Shibuya Crossing is thought to be the busiest in the world and has been made famous by many a film. Experience the pulsing heartbeat of Tokyo at this incessant intersection. Anime fans should tour Tokyo’s Ghibli Museum, dedicated to the work of Hayao Miyazaki of Studio Ghibli. Tokyo National Museum houses the world’s largest collection of Japanese art, from samurai swords to silk kimonos. Shimo-Kitazawa is a pedestrianized maze of lively bars and restaurants that attracts the artists, musicians and hipsters of Tokyo. Takeshita-dōri is the Camden Market of Tokyo and is a must-visit for fashion lovers. Make use of Tokyo’s world-class transportation. Get a rechargeable travel card and hop on the bus, underground and over ground systems. Few places in Tokyo offer free Wi-Fi so make sure you have a way to connect. When driving or walking, keep to the left to avoid being a public nuisance! Tipping is not a thing in Tokyo and will often be refused. QR codes are big in Tokyo, and are also really useful, so have a QR code reader app handy.